Insignia cloth was used to make the skull and crossbones on the sail as well as the racing stripes on the deck. 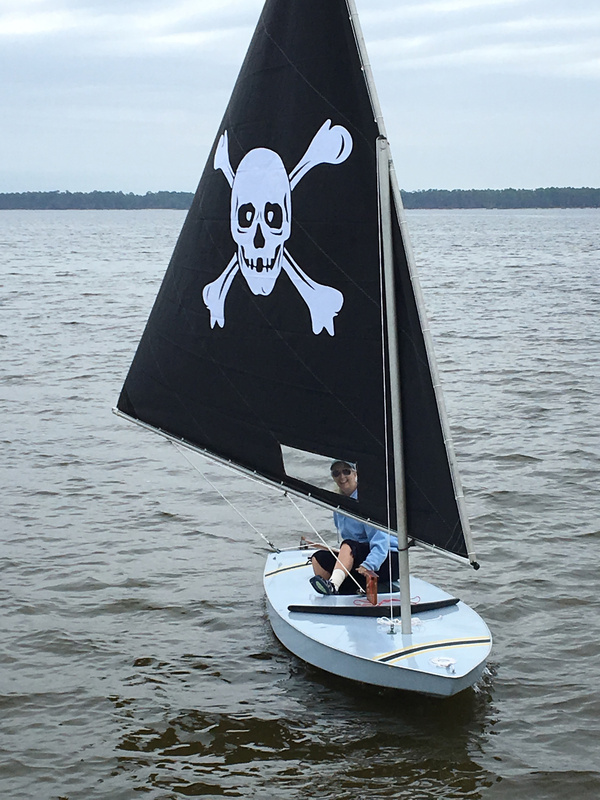 We once decided to put a skull and crossbones on a black lateen sail for a Sunfish and, rather than take on the very awkward task running it through the sewing machine, we used adhesive-backed insignia sailcloth. The material was easy to use, and it has held up well in the marine environment and harsh sunlight of Florida. Adhesive-backed sailcloth is commonly used for numbers and class insignia on sails. It comes in several colors, and we used Challenge brand, purchased from Sailrite. The lightweight 3.3-oz polyester fabric ensures that the insignia does not interfere with the shape and pliability of the sail. There is a heavier fabric available from Contender that has additional UV treatment and weighs about a half ounce more than regular insignia sailcloth; it comes only in white and is well suited for repairing sails. The peel-off paper backing on Challenge cloth has a grid to aid in tracing out insignias and numbers. 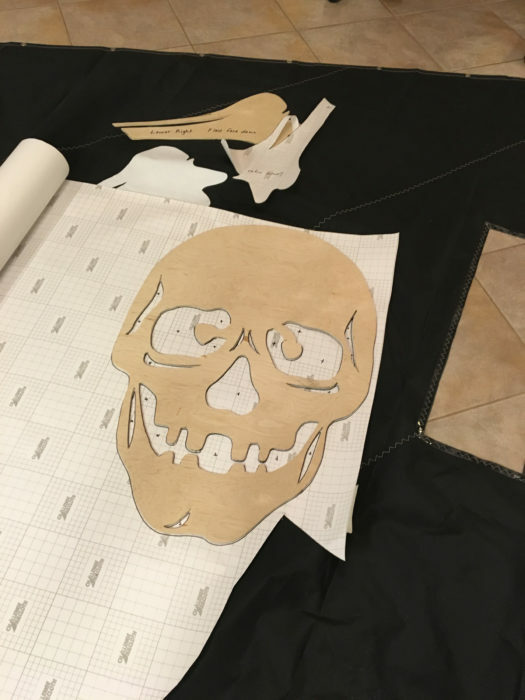 The plywood pattern for the skull sits on the backside of the white insignia cloth, ready to be traced. The cloth’s removable backing, marked with a grid, is removed to expose the adhesive. We make patterns on stiff paper or thin plywood, then flip them over to trace them on the back of the cloth so the pieces will read properly when applied to the sail. Once the pieces are marked on the backing, it is easy to cut out the shape with scissors, or an X-Acto knife in tight corners. Sails should be cleaned before installation; follow the manufacturer’s directions to select the proper detergent or soap. 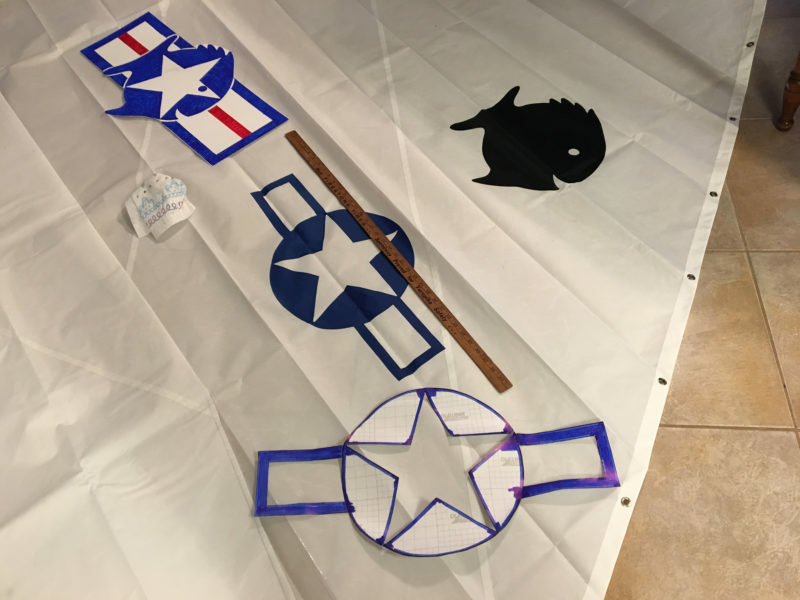 The adhesive sailcloth is best applied in moderate temperatures; the backing peels off easily, and sailcloth pieces can be moved a few times to ensure smoothness and correct placement before being pressed more permanently onto the sail. The adjustability comes in handy when there are a lot of pieces to work with, as there were with our Jolly Roger’s teeth. The directions recommend leaving the sail flat overnight while the adhesive fully cures. Sewing the insignia cloth’s edges make for a more permanent installation, but our applications have adhered well, even over the uneven surface of a sail’s seams. The authors restored an old Sunfish, and Kent is a pilot, so a combination insignia is in the works. We used some red-and-white cloth to repair our Alcort Catfish sail. It was easy to cut the cloth to size, about an inch larger all around than the repair areas, and apply patches to both sides of the sail. Small repairs do not need to be sewn, so bits of adhesive-backed sailcloth for expeditious repairs are a good addition to a ditty bag. Adhesive sailcloth serves well where spreader patches and wear strips are needed. 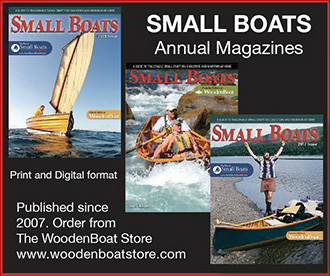 We’ve even used some to make nice deck stripes for two Sunfish. If your sail numbers change or you decide to trade Jolly Roger’s crossed bones for crossed sabers, insignia cloth is reasonably easy to remove. Audrey, a theater costume designer who has been manipulating fabric for a long time, gives adhesive-backed sailcloth two thumbs up. Audrey and Kent Lewis currently seek prizes on Pensacola Bay with their menagerie of sailboats, kayaks, canoes, and paddleboards. Sailrite and Seattle Fabrics are among the sources for adhesive-backed insignia sailcloth. It may be available at sail lofts. Great article, very interesting to know that adhesive sailcloth doesn’t require stitching and stays put. Love the skull and crossbones. I’ll have to steer well clear of Pensacola Bay if I want to hang on to my pieces of eight. Good info. I’m needing to do this to some sails so I can get my insignia/logo on the sail.